Furthermore, the Institute runs long lasting cooperation with renowned institutions and experts both in Germany and abroad. The cooperation is carried out from case to case, if subject-specific and country-specific knowledge is required for a project. Steinbeis Foundation was founded in 1971 due to the initiative of the former Prime Minister of the Federal State of Baden-Wuerttemberg. The headquarters are located in Stuttgart. The foundation is named after Ferdinand von Steinbeis (1807 – 1893), who was a leading initiator and promoter of industrialisation and vocational training/ education. The most important objectives of the Steinbeis Foundation is the initiating and promoting of international technology transfer. This conglomerate can also be named or considered as an alliance-system or as a holding. Several units of the holding are working under the same roof. While the Steinbeis Foundation is a non-profit organisation, the residual two other pillars are private entities and profit-oriented. The Steinbeis Foundation is quasi the nucleus of both Steinbeis Technology Transfer and of the Steinbeis University Berlin. 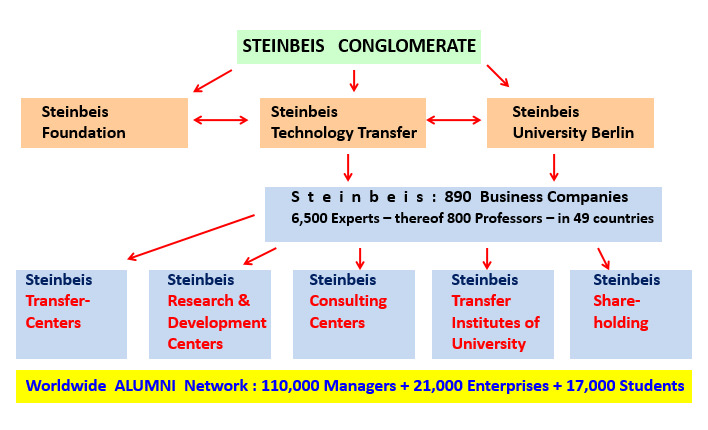 The following graphic provides a short overview of the Steinbeis Conglomerate.